Cozy Bungalow in Manitou Springs! Minutes from Pikes Peak! Come escape and unwind at this charming Spanish-style bungalow nestled beneath the Garden of the Gods Park in historic Manitou Springs! 'Manitou' is the Native American word for 'spirit' and after you spend time here and the surrounding area, your spirits will definitely become awakened and refreshed. The bungalow sits high above the road taking you away from all your worries. Snuggle into this quaint bungalow and wake up gorgeous Colorado sunshine and blue skies. Relax in the breakfast nook as you enjoy a cup of coffee or tea and breathtaking views of Pikes Peak and hopefully a visit from one of our local deer. Breathe crisp and cool air as you take a morning hike or bike through a national landmark (Garden of the Gods) - right in your backyard! 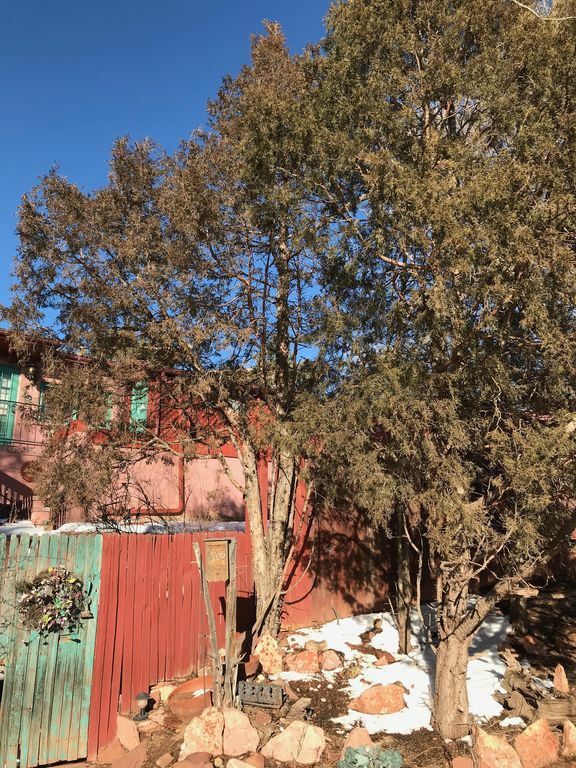 Explore Manitou’s unique shopping district, take a sip from one of the nine named mineral springs and stop by the local cafe for a cup of coffee or soothing pot of tea. Later, return 'home' to sit on the deck and enjoy the surrounding mountain range and watching the sky turn bright pink and orange at sunset - all while the barbecue heats up for an awesome grilling experience. The house is not air-conditioned but we have found if you keep the blinds shut during the day and open the windows at night, most evenings are cool and the ceiling fans provide any cooling needed. Feel like exploring? Experience the Manitou Incline or one of the local hiking and biking trails just minutes away. Enjoy a soak (and yoga) at the SunWater Spa less than 1/2 mile west on the same street. Stop in for a local beer at the Buffalo Bike Lodge east on the same street walking distance. Shuttle stop to town or take the walking path to the city pool for indoor swimming, gym, and outside kiddie pool. Enjoy beautiful drives and hiking, tourist stops like the Olympic Training Center, Air Force Academy, Cave of the Winds, and much more. Take a hike, bike, drive, and even run up to the top of the 14,110-foot summit of Pikes Peak! Skiing is available within two hours at several places (which are open in the summer for some great mountain biking)! Shop for antiques and souvenirs in Old Colorado City, at wholesale outlets in Castle Rock and Dillon and at the Shops at Briargate and Chapel Hills Mall in Colorado Springs. Just ten minutes away downtown Colorado Springs has many unique shops. Wine and dine at local micro-breweries such as Manitou Brewing Company and Bristol Brewery at Ivywild. Take a stroll past millionaire mansions (Cripple Creek Gold) on Wood Avenue and head to The Broadmoor Hotel which is a beautiful site to explore, as are the nearby Cheyenne Mountain Zoo, Will Roger’s Shrine, and Seven Falls. As for other museums, the Fine Art’s Center is stocked with art from all over the region and the Pioneer Museum is a fun place to learn Colorado history. Other nearby attractions include Colorado Wolf and Wildlife Center, Florissant Fossil Beds, Royal Gorge, Western Mining Museum, Rockledge Ranch (run the old fashioned way with a blacksmith, antiques, etc. ), regular and fly fishing, gold medal fishing, pay for what you catch fishing, and tons of hiking trails. Gamblers will want to try their luck at Cripple Creek casinos. Cripple Creek, once a booming mining town, also offers local mine and jeep tours. Attend interesting local events such as Manitou Mardi Gras parade. Emma Crawford Coffin Races, Springspree, Cripple Creek Ice Festival, Donkey Derby Days, Pikes Peak or Bust Rodeo, the Labor Day balloon festival, the Pikes Peak Hill Climb Auto Race, etc. E-mail for more information about the bungalow, local events, or the area - or call us at the number listed below. We are natives of the 'Springs,' and know all the best restaurants and site seeing in the city, and state! We'll help, or not! Just let us know. We’ll keep books and articles about the area in the house, as well as maps for visitors who want to spend a few days driving and exploring ALL of Colorado! Happy vacationing from our family to yours ~ Karyl, David, Alison, Mike, Owen, & Hilary! We have lived in the area for over 50 years. This bungalow belonged to Karyl's mother who lived in and loved this home for over 30 years. We have two daughters, one son-in-law, and one grandson who all live in Manitou Springs. We hope you enjoy our cozy pink bungalow. The location is perfect because it is close to many wonderful attractions, including wildlife, and is within walking distance or a short drive. Our rates are competitive as we have chosen to include all cleaning and other fees and taxes in our nightly price. The deposit is refundable. Quiet home that sits above the street. Off-street parking for one vehicle. Unobstructed views in front looking out on field with mountain views. Conveniently located to all attractions and shopping. Perfect view of Pikes Peak and surrounding mountain range from most windows in the house, as well as outside. We have a wide variety of CDs. We have a variety of VHS movies, which includes children's movie titles. Deck seating for 6 with table and umbrella. Has a perfect view of Pikes Peak. We had a great time in your charming bungalow. It was well stocked and just perfect for our needs. The location was excellent and close to everything we needed. We spent another week in a different location and wished we had just stayed put because your home was so much better. Thank you for sharing your home with us. We really enjoyed our stay! This place is quaint, cozy and looks exactly like the pictures. It's probably the best stocked rental I have ever booked. Lots of towels, spices, band aids, creamer, coffee filters - you name it - everything you would have in YOUR home. Deer wandering right in front of the house in the morning. Clean house, nice linens, cable and wifi worked perfectly. Sizable, private, outdoor space with a view of the mountains. Garden of the Gods a few minutes drive (I guess you could walk but we didn't). We ziplined, hiked, visited local breweries, drove to pikes peak and the zoo. Great trip, great property! Would recommend! We very much enjoyed our stay at the Red Rock Retreat. We stayed for 7 nights with my husband and two kids, ages 3 and 6. It was close and convenient to everything that we wanted to do. The house was clean, comfortable, safe and had everything that we needed. Highly recommended! Wow! This was better than we expected. The place has great character. We met with our whole family for a vacation and the place made it so wonderful. The mornings and evenings with the deer coming to visit right outside the window was so awesome! We had something to do all the time when we were inside, games, cards it was great. The place had was everything and more. We will definitely return!!!! My wife and I couldn't be any happier with our extended stay here at the bungalow over the winter. The views are great, the neighborhood is great. We'll miss our daily visits from the local deer population. David and Karyl were very gracious to have us and so very easy to contact and deal with. The location is great to get anywhere from downtown Manitou to Old Colorado City or Garden of the Gods right behind. We would not hesitate to stay again or recommend to friends or family coming to visit. A big thanks again to Karyl and David. I can assure that you will not be disappointed in your stay here. House had no privacy, there were all sorts of people wondering around and cars parked in front of the House staring at it. There's the inappropriate and arrogant fact that a book was left on our bed. But the most shocking part was owner rudely writing to us calling us thief s because apparently we used too much toilet paper and hand lotion left at the Property. Absolutely won’t recommend. We are sorry to hear our rental did not meet your standards during your 2 night stay. The house is located on a neighborhood street that is directly across from a beautiful soccer field accessed by school youth and their families. We are the main road to a beautiful park, The Garden of the Gods Park and downtown Manitou Springs. People who walk or bicycle by our rental nestled high above the road, which makes it private, often stop to look up at the "unique pink house" !! We are also sorry if you felt the book titled "Dreams" that we place on the bed was inappropriate and a concern for you. The book is just a symbol of extending a good nights rest for our guest to be read or set aside. As for the missing supplies, we were surprised to find our full size refillable lotion and soap pumps were missing, along with all the toilet paper rolls and tissue boxes during your 2 night stay. Of course guests are welcome to use what they need during their stay and perhaps we need to include more supplies for upcoming guest. Please note the entire security deposit was returned to the guests and they were never referred to as thieves. Within walking distance to Garden of the Gods Park. One mile to downtown Manitou Springs. Family-friendly park one block away which includes a skateboard park, tennis court, playground, and paved walking path along Fountain Creek. Rate includes all taxes and cleaning fees. Rates are flexible for stays of 7 days or more.